Balloons Face Painting and More! Balloons Face Painting and More brings you trained balloon artists, also known as balloon twisters, face painters, magicians or even clowns to your special event, creating fun memories and laughter for any occasion. All our entertainers are 100% trained in their specific area of entertainment and are insured and background check for your peace of mind. With over 25 years of experience creating fun memories for people of all ages, Balloons Face Painting and More, guarantees 100% that your event will be a one to remember, because after all... entertaining is our passion. I'm Chatters, Chatters the Clown that is, and that's my job, to bring the love and laughter, tickle your funny bone, and leave you with memories for a life time to come! I love to make people smile. Big people, little people, young & the young at heart! Weather I'm helping you celebrate your 1st or 101st birthday, painting your face or making your favorite balloon animal, my friends and I, guarantee to put a smile on your face, put a giggle in your heart and remind you how great it is to be a kid! Chatters and friends specialize in making every event a special one. We customize birthday parties, grand openings and charity events. Working with you, to make each one special and unique. Chatters offers special themed parties for her little friends. 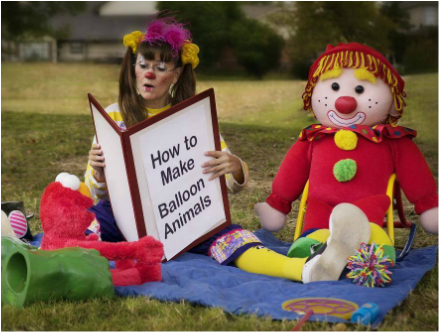 For ages 8 and up, she offers big kid FUNSHOPS, where her party friends learn to make their own balloon animals, learn to juggle or they can learn a little clown magic! If you're interested in making your next event an extra fun, extra silly, or an extra special one, give chatters a call at ​(918) 369-3864, and let us help you make your special event one that you will remember for giggles to come. ​If it matters, call chatters! Thank you for choosing Balloons Face Painting And More!